I read Stephanie Morrill’s first book, Me, Just Different earlier in the semester and absolutely loved it! 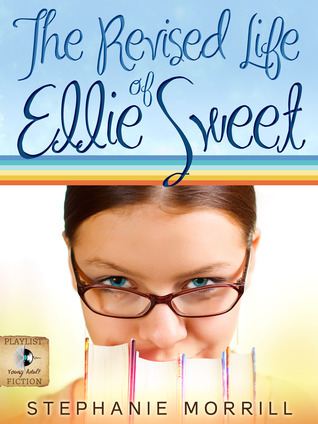 Needless to say, I was very excited when I heard about her second series coming out, The Revised Life of Ellie Sweet. The Revised Life of Ellie Sweet follows, you guessed it, Ellie Sweet. Ellie is a teen writer which made me love her from the get go. Our heroine is thrust into all the fear and excitement of the publishing world while also facing friend drama and boy drama as her set group of friends begins to crumble around her. And as much as Ellie thought she just wanted to get lost in the fictional world of Lady Gabrielle in medieval Italy, the boys in her life keep demanding her attention. Ellis as a character connected with me in a way not a lot of characters do. Stephanie Morrill spends a lot of time with teen writers and it really shows through in this book. Ellie seemed to me to be a very real person with a great personality and inner conflict. In my opinion, her voice is spot on! If there’s one thing I think Stephanie Morrill is really great at, it’s any kind of changing relationships. I noticed this in Me, Just Different and was really happy to see it happening again! Stephanie shows how characters go from friends to enemies, sort-of friends to a couple, and no relationship what-so-ever to BFFs. In my opinion, the crafting and time she put into these relationships showed! One other note. The boys. Oh my goodness, the boys! It’s totally understandable how Ellie can’t decide between the two boys in her life. At first I was rooting for Chase, then I wanted Palmer, then I was back to Chase again. This was done very well. My emotions swung like Ellie’s between these two boys. I also really appreciated how clean this book was. As a high-school teen, I know several middle scholars who enjoy teen romance novels, but there are so few I feel I can recommend to them because they have trashy language or trashy morals. I loved how this book has neither. This is a book I wouldn’t have a problem recommending to any of the younger girls in my bible study or at church. But with that, there is something I feel needs to be mentioned. The Revised Life of Ellie Sweet is under the Christian section of Amazon. Ellie prays sometimes. She goes to church. But that’s just about where the Christian aspect of this book ends. From what I remember, even the Christian role model in her life doesn’t talk to Ellie too much about relying on God, seeking God’s will, or encouraging Ellie to look for her fulfillment in Christ. This was a little bit of a letdown for me, especially after seeing the same author do such a great job with the Christian aspect of her book in Me, Just Different. I understand that the author is trying to appeal to a wider audience, but I feel she might also be unintentionally sending the message that it’s alright for Christian to date a non-Christian, which I feel is untrue, especially for high schoolers. On the whole, I really liked Ellie’s story. I read it in one sitting on the way home from vacation and the ending satisfied me. I liked the story within a story; the way Ellie uses her writing as an escape and the novel this 16 year old had to tell. I would recommend this book to any girl in seventh grade or older, Christian or otherwise.